16 October 2015, Elsewhere in the world, proponents of small nuclear reactors are pitted against the large reactors, but here in Australia, as Noel Wauchope reports, proponents of small reactors see them as enabling conventional nuclear and uranium mining to flourish. QUIETLY, AND pretty much under the media radar, a dispute is going on in the global nuclear industry between the advocates of “Generation III” — big nuclear reactors, and “Generation IV” — small nuclear reactors……. 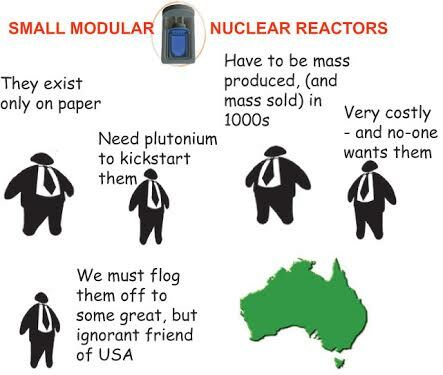 the nuclear lobby’s spiel to Australia is something different, and very original. No dispute — because the argument is that small reactors would further the large reactor industry. First articulated by Oscar Archer on ABC RN, March 2015, the idea is that Australia, in setting up small nuclear reactors, would enable the conventional nuclear industry and uranium mining to flourish:….. As Archer says, Australia would indeed be the pioneer for the new technology. And that’s what the USA “new nuclear” lobby desperately needs. They need this, because they’re finding it impossible to go ahead in America. Why? Well it’s those pesky safety regulations imposed by the Nuclear Regulatory Commission. regulations – to set up their nuclear reactors on a test site. 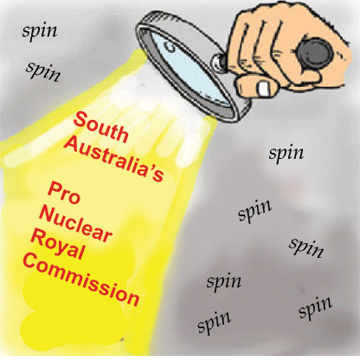 Hence the enthusiasm of those lobbyists for the South Australia Nuclear Fuel Chain Royal Commission, as shown, for example, in a recent Royal Commission hearing speech by Thomas Marcille of Holtec International nuclear company. I am not sending emails to you.